Browse: Wyonegonic Camp / About Us / Blog / Blog / Hosting the first ANSI Training in the World! Hosting the first ANSI Training in the World! 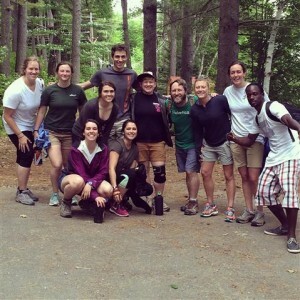 This is an exciting year for the Ropes Challenge Course industry. The American National Standards Institute (ANSI) has designated ANSI/PRCA 1.0-3-2014 Ropes Challenge Course Installation, Operation & Training Standards as the American National Standard for the entire range of the industry, including challenge courses, aerial adventure parks, zip lines and canopy tours. 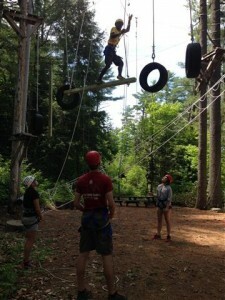 Wyonegonic Camps is pleased to announce that in early June, we partnered with Adventure Mas to host the first ever training for Low and High Ropes staff to become certified in the new American National Standard. Mike Barker was the lead instructor for this training. Mike has been involved with Adventure Mas for over six years and was recently appointed to the Adventure Mas Director’s position. Mike has been involved in the industry performing training, facilitation, course operations, building, and inspecting since 1978. Mike is currently the Vice-President of the Professional Ropes Course Association (PRCA) and has been the primary assessor for the PRCA’s Accreditation program and the principal editor of the new American National Standard for the industry. Congratulations to the camp staff who achieved certification as Level 1, Level 2, Course Manager and Course Administrator Director levels! The participants are awarded two year certifications for having successfully completed the training and assessment. Our front gate, which is a memorial to former director George N. Sudduth, reads Discover Share Preserve. Copyright © 2019 Wyonegonic Camp. All rights reserved.